When I bought my first gun (long manual) from the other hand, I read the ad, the price includes a collimator, so I thought that this is just a "fashion accessory" to the gun to make it look more "action" . At first sight this is really so. It is true that I mean by the red dot rather represented an additional flashlight or laser (feel free to laugh at me, today I also laugh, but I was not so far from the truth :-), so I "such that the slide" a little taken aback. There were also disappointed that the seller owner had come off the back of a rifle sight to be seen in the collimator and then as a tiny thing like losing the rear sight. After the first few dozen shots, I discovered that red dot is not a bad thing. I still remember on the air rifle shooting, where he showed a visual kind of dementia, when I was not able to constantly monitor the fly to align a target. Does lag between close focus and the distance was just too big and I do not want to see me shooting at a moving target. Collimator quite unexpectedly that my (and not only mine) handicap removed and since then it swear. And what is the magic? It is almost devilishly simple. In the collimator is the light source (LED), which is directed against a special lens. Color LEDs you can not choose . In the market, I saw perhaps only red, green and blue. But it has any effect on the shooting. Perhaps only when you aim at a target, which is the same color as the light diodes, so he can lose. The slides are slightly dark colored with antiglare, due to unwanted light reflection, which can divulge you as shooter. Because the source is the only spotlight and diameter collimator is purposely small enough that you could not see him in both eyes, lose the plastic perception of light sources (but plastic sensation around the same!) And the reflection appears to be at infinity. If you move the head so the dot moves across the slide, so-called collimate. As is known angle of incidence = angle of reflection and until you look enough, so you will see a dot constantly on the goal. 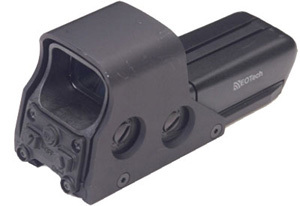 Basic red dot are two kinds - open (for example OKO, which uses our URNA) and a flanged diaphragm (closed, where is probably the most famous representative of the American Aimpoint), but both work on the same principle. An interesting fact is that military units tend to use tubular and open police unit, which recording the consideration that some advantages in different environments must have. My guess is that the tubular is more appropriate to the nature and wherever it threatens clogging dirt. 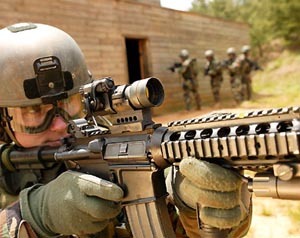 For this reason tubular red dots are also often equipped with hinged caps which ensure the protection lenses. In contrast to the open red dot all dirt pouring in and it is not unreasonable to occasionally brush up. Price opened red dot is on average lower than in the tubes. 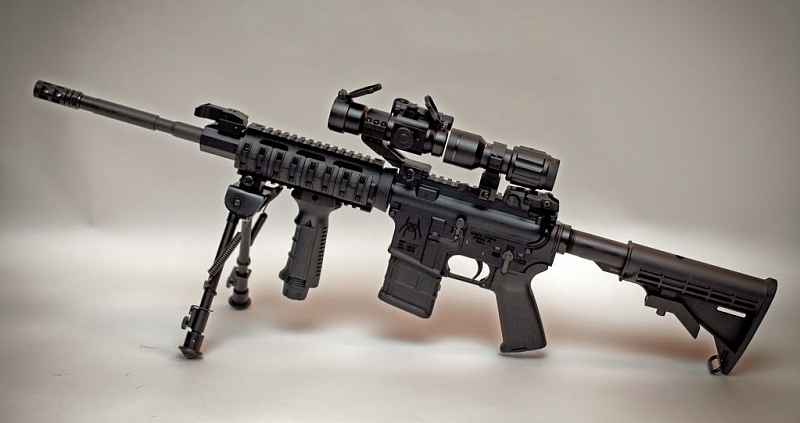 Fastening on the weapon is done mostly with mounting rings and mounting on a rail , which just on the gun you have. Most sellers will be happy to advise you on what your options are attaching your selected collimator just on your weapon. The exceptions are some cheaper collimators, which are suitable only to a limited circle of weapons and consolidation is not the most reliable. Perhaps the best known of this group is Gamo DirectPoint red dot, which is mounted mainly on a manual for such a tiny projections - just a little carelessness and six hundred will lie somewhere in the woods. With the attachment is related to a total of one important attribute and that is the height of the collimator on the weapon, or the difference between the axis of the barrel axis scope and the axis of the eye in the most comfortable position while aiming. Sold high and low installation and it is up to your choice, and you choose which suits you. Always prefer the convenience of shooting, so you will not have to cringe at the shooting or that you have not pulled the neck. 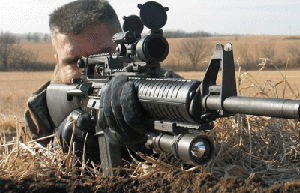 A major advantage over mechanical sights is that the targets are watching with both eyes. This fact affects several optical laws that speaks mostly in favor of the shooter. First by not closing one eye, you'll save a fraction of a second and that time is running out in the battle surprisingly quickly. Another and probably the biggest advantage is that it pursues an objective of two horizontally placed dots (eyes), so the image gets plasticity and therefore much easier to estimate distances and generally see better (recognizable enemy or potential obstacles in the shooting ...). Also, do not come on behalf of paraphernalia peripheral vision, so your enemy can not so easily surprised on the side. Then there is the safety issue when shooting on the move - see the "peripheral" your step and where they eventually fall. Thanks reflection dots on a slide in a seemingly endless it's always sharp enough, whether you aim 10 m or 50 m in front of each other so that the eyes to focus solely on the target and you burn. In older people, and for me it just manifests impaired accommodative lens of the eye - here the problem is eliminated. The big advantage is also aiming in the dark when the mechanical sights are often very dark color (if you somehow do not adjust) and when shooting will not find them, so you need to fire from the hip, or "main aim". Brightly illuminated dot collimator will see even in the greatest darkness. I met a couple of negative qualities, as well as in each case. Just when you aiming in the dark, you immediately disclose light-emitting diode, so that the enemy knows approximately where your head is and knows where to fire. Additionally, intensive shining point of your collimator quite annoying at night and partly reduces the effect of "night vision" that the human eye after a certain time in the dark can induce. On the other hand, it must be said that the quality collimators have the ability to adjust the brightness of the dots (7-11 levels), which nullifies this issue. Almost invisible dot in the day, when large enough at night. Who tried, and certainly knows what I mean. Another negative aspect is that under the bright sun, you can tell a reflection of "Pigs" from the front lens. This is especially true on cheaper models without antiglare glass front. I was also interested in the legal aspects of the entire facility. 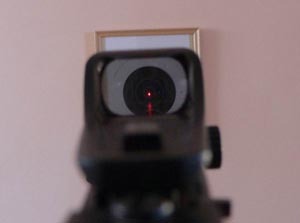 As is known to all, and in the Czech Republic is prohibited instal on weapons various lasers, which theoretically have the same function as collimators. But in our legal system distinguishes whether the pointing device is transmitting forward some rays (light) or not. 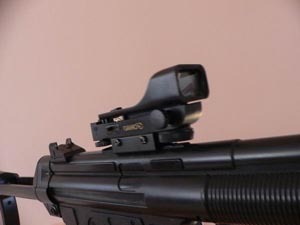 Since the collimator is not primarily intended to target using direct light, but only a reflection, not within the category of devices that can not be mounted on the weapon. To summarize - collimator is a great device that allows you in some hot moments of the fight can help massively. 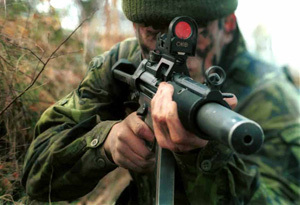 It is reported that a trained gunner during the transition from mechanical sights instal collimator can streamline (it is meant the rate of fire with the same precision) his shooting up to one third. For an untrained gunner impact could be up to twice !!! I think that is clear evidence of the usefulness of this stuff, which is not so expensive if we will do some of those cheaper airsoft models. Original red dots for tens of thousands of airsoft is indeed a very great comfort.